Moving from the recruitment of Robert Oppenheimer to the building of Los Alamos to the testing of the bombs and Hiroshima and the eventual arms race between the United States and the Soviet Union, this excellent non-fiction book cleverly interweaves three story lines. The first is the Americans’ attempt to build the atomic bomb. The second is the Soviets’ attempt to steal the plans for the bomb. 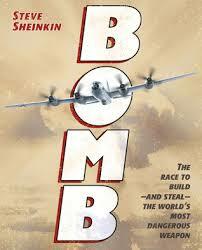 The third is an attack on Germany’s heavy water plants in an attempt to prevent Hitler from building an atomic bomb. Full of material that illuminates a period of history few middle school and high school students may be familiar with, this engaging read will keep them interested. I’ve also recommended it to adults, because it provides real insight into the scientists that built the bomb, their motivations for building it and the motivations of some scientists to ensure that the United States wasn’t the only country in the world with this most powerful weapon. Photographs are included. Winner of YALSA Award for Excellence in Non-fiction for Young Adults, the Silbert Medal, a Newbery honor and a National Book Award finalist. If you’ve ever wanted to make a young audience scream with delight, read them this book. You’ll need an audience volunteer. 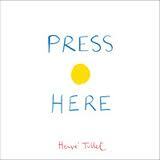 Press Here is magical. Not only did my older students absolutely loved it, but my younger students are completely overjoyed by it. I had to ask them to keep it down, or the fifth grade next door wouldn’t be able to work! (My first graders even recognized a pattern in the book and started chanting it.) Highly recommended as a read aloud. Synopsis: Follow the instructions in the book (involving pressing dots, shaking the book or clapping) to see what happens. Is it magic? Maybe! Wonderful! What if you knocked out your two front teeth…in middle school? Smile takes me back to the times when I had braces and when I also had to figure out which friends were truly friends. It’s a great book that just flies off my library shelves. I can see why. It’s great for fifth graders and middle schoolers. For those of you who love this book, the same author wrote another book called Drama. Synopsis: Raina knocks out her two front teeth when she trips and falls. So begins an odyssey that includes false teeth, retainers, braces, headgear etc. all during middle school when everyone is as self-conscious as humanly possible. Following Raina through middle school to high school, this book takes her through her friends’ reactions to her appearance and her first crush on a boy. Finding that her friends are not necessarily good friends, Raina finds a new group in of friends in high school who are supportive and don’t care about her appearance. Kevin Henkes is a well-loved author. 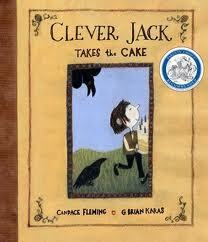 With very little text and simple black and white drawings, this book is perfect for read alouds with young students. 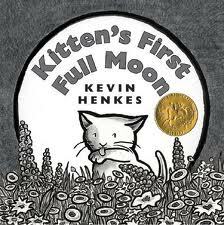 Kitten wants a glass of milk and mistakes the moon and then the moon’s reflection for a bowl of milk. Poor kitten! Luckily, kitten goes home and finds a nice glass of milk. Have you ever asked your mom for a dog and gotten the run around? “Dogs are too loud.” “Dogs are too messy.” Well, what if you asked her for a dragon? Thinking that she’s being clever, Mom says “yes” to the dragon. Big mistake. It turns out that dragons are VERY bad pets and won’t leave when you ask them to leave. Luckily, they are terrified of dogs. So, when it’s time to get rid of the dragon, what better choice than a dog? This funny, clever book won applause from my second graders. 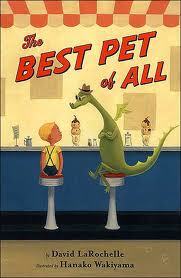 What a great read aloud! For your kids that love dystopian novels. 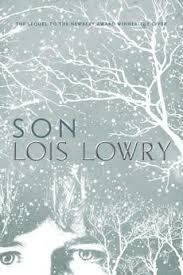 Son, is the fourth novel in The Giver series. The Giver is one of the original dystopian novels without all the violence. Son can be read on its own, but definitely has more meaning if you’ve read the Giver and is better yet if you’ve read books two and three, Gathering Blue and Messenger. I loved this book. There was just the right amount of suspense, the characters were really beautifully drawn and there the element of “creepiness” that dystopian readers crave. For those who have read the previous books, it’s fun to try to trace where this book intersects with the previous books in the Giver series. Synopsis: Claire is assigned to be a birthmother at her 12 ceremony. She and other girls are to give birth to “products”. Once they’ve given birth to three products, they move on to another job in society. Claire has difficulty with her first birth and is quickly reassigned to another job. So quickly, that those in charge forget to give her her daily pills. Slowly her feelings for her son awaken. Claire imagines running away with her son. Her son, a difficult baby and toddler has been chosen for “release”. That’s when Claire discovers that her son is missing, taken away by a boy from the community. So begins Claire’s desperate search for her son.